The Baby Reds are lagging in the USL’s Eastern Conference having played fewer games than every other team while awaiting completion of their stadium renovations. They’ve played nine of their first 11 games on the road — including their first eight games away from home. Toronto native Molham Babouli leads his side’s offense with two goals and two assists in his nine USL appearances. Jordan Hamilton notched the only goal in TFC II’s last outing to see off the Wilmington Hammerheads by 1-0 on June 27. The squad is made up of roster filled with home-grown talent — fielding 13 of 19 players from Ontario. 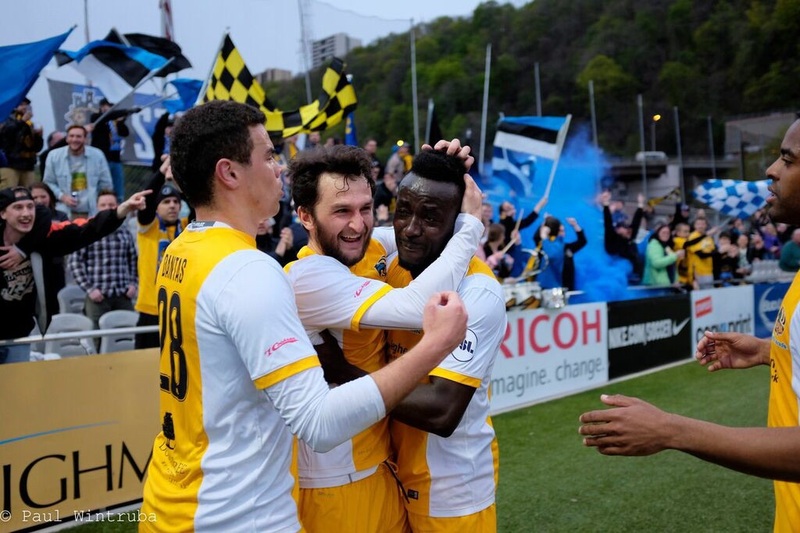 In their only encounter of the season on April 26 at Highmark Stadium, it was a tightly contested first half, but the Riverhounds broke it open after Tarik Robertson was sent off when fouling Kevin Kerr in the box. 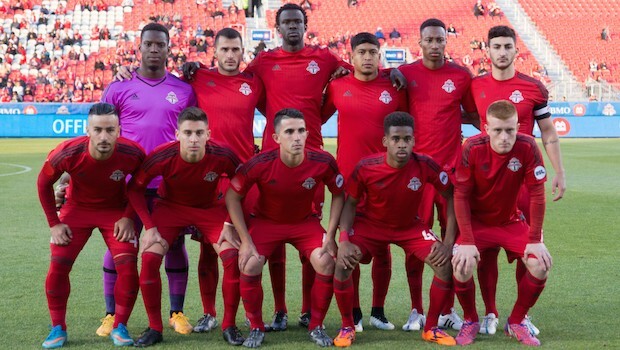 The Hounds added three goals in the second half to pull away from a shorthanded Toronto FC for 5-1 win. Tyler Pasher, an Elmira, Ontario native who played in Toronto F.C.’s Academy and youth system, scored his first goal of the season against his former youth team. Pittsburgh will provide the first opposition for Toronto at its refurbished Ontario Soccer Centre complex Wednesday night. The entire organization has been extremely eager to finally play on home turf, especially TFC II midfielder and Vaughan native Luca Uccello. “We’re all tremendously excited you know, just play in front of your home fans, it’s unbelievable,” he told the Canadian media prior to training on Monday. “Now that we’re in my hometown it’s amazing and I can’t wait to get out there and play,” he continued. The Riverhounds tied with New York Red Bulls II for fifth place in the USL’s Eastern Conference standings, but currently hold the edge in goal differential. Wednesday’s match is part of a two-game, Canadian road trip for the Hounds. They will face F.C. Montreal at Stade Saputo on Sunday afternoon for a 4 p.m. kickoff. Rob Vincent will look to add to his league leading goal and points scoring totals. He currently is neck-and-neck with Oklahoma City’s Danni Konig, as both have 11 goals. In addition to being tops in the USL in goals scored, Vincent’s also leading the league in goals-per-game, points and points-per-game categories after two superb finishes against the young Bulls. “There is not a player in the league right now that I would feel more confident in finding the net than Rob,” said Riverhounds assistant coach Josh Rife. It will be a Canadian homecoming for two Hounds, Pasher and Miro Cabrilo. The Riverhounds didn’t have any injuries to report earlier this week. Riverhounds Head Coach Mark Steffens will select 18 players for the trip from a full roster excluding Ryan Thompson. The Jamaican goalkeeper departed for Los Angeles this weekend to join the Jamaican national team roster for its tilt at the Concacaf Gold Cup — which is also tonight at 8 p.m. vs Costa Rica. Captain Danny Earls and defender Willie Hunt return after serving one-game suspensions in Saturday’s win over New York. Kerr and Anthony Arena currently sit on four yellow cards apiece and will face one-game bans if they pick up another caution. The Hounds travel to Canada in good form having played maybe their strongest 90 minutes of the season defeating NY Red Bulls II, 3-0. This will be a good opportunity against two teams in the lower half of the standings for Pittsburgh to improve its paltry road record (1-4-1). Thus far, the Hounds lone win on the road was in defeating Richmond 2-1, in early May. It was an impressive win, but they continued road woes with defeats at Charlotte and Rochester. Both of their most recent road losses also featured another common denominator — having players (and coaches!) sent off. The Hounds will have to maintain their composure in the face of adversity. It’s also important that they earn four to six points on this trip if they want to stay in good position to earn a playoff spot, and challenge the teams in front of them in the USL’s Eastern Conference standings. In the last match between the two teams, Toronto came out strong, playing with lots of skill, athleticism and winning many 50/50 balls. The Hounds were the more patient and disciplined team — and once they were comfortable and possessing the ball — they seemed to have their way with the young Toronto squad. It should not be that easy this time around. The Baby Reds will be excited, playing in their new facility — so the Hounds should be prepared for a tough match from the opening kick. Fans will be able to watch a live stream on Riverhounds.com.